Tag Archive | "U14 Elite Girls Team"
CASSA was founded in 1998 to help area soccer players who had played recreational soccer advance their game to a higher level known as “Select.” This U14 Elite Girls Team, comprised of 16 players and 3 coaching staff, not only took their play to the next level but also made CASSA history in the process. For two consecutive years, they have remained undefeated in their league play. 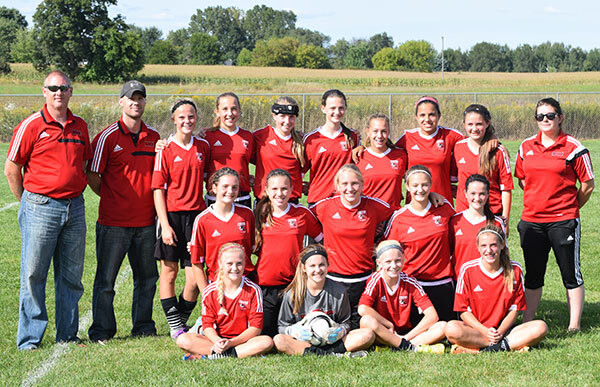 Headed into this season as Elite they remained undefeated, and on September 19, they won their game against a tough club from St. Joseph, Mich., to become the most winning team in CASSA history. Go lady Tri-Hawks!